Those who support the ATBL at the highest level are invited on an annual trip to London to visit the British Library and to spend a day or two at another outstanding library of historic house. 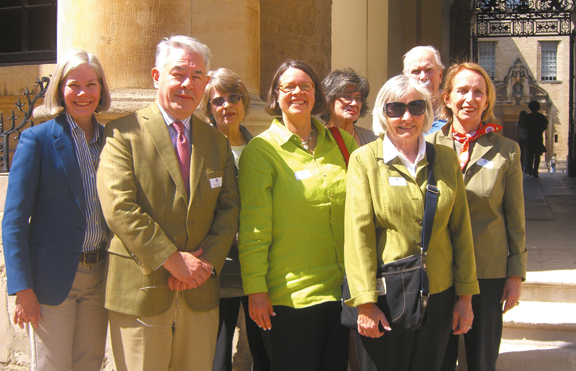 This year the Chairman’s Council trip participants spent time in London and Oxford at the end of June. Ruth Robinson, ATBL Board member who lives in Dallas, and has a house in Armonk, NY and London, hosted a cocktail party on the first evening. She welcomed members and guests at her lovely apartment overlooking Cadogan Garden. Monday morning the group took a private coach to Oxford. 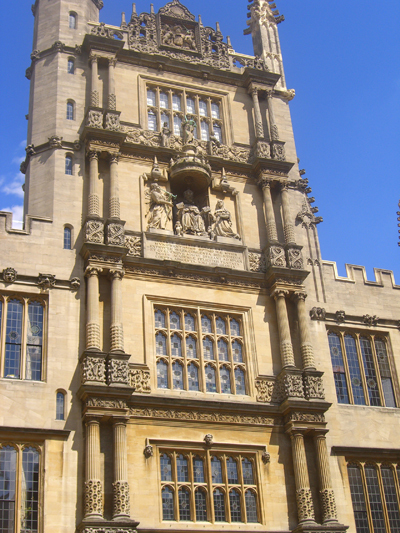 After checking in and having lunch, the group met Sarah Thomas, Director of the Bodleian Libraries and then were given a tour by Wilma Minty, who was such a help arranging the Oxford portion of the trip. They visited the old and new portions of the Library, had a show and tell of special items by three Curators form Special Collections and saw the still functioning book retrieval system. 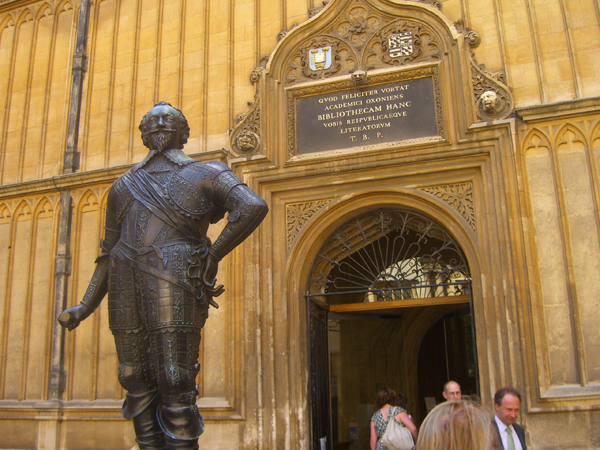 Ms. Minty gave a tour of the grounds, architecture and statues, including Thomas Bodley and his chest for keeping his treasures. initials or arms of those who contributed to the cost of the building. Sarah Thomas, who is an American, formerly at Cornell University, joined us for lively dinner discussion. Walking back to the hotel on the Summer Solstice in glorious weather was a perfect ending to the day. 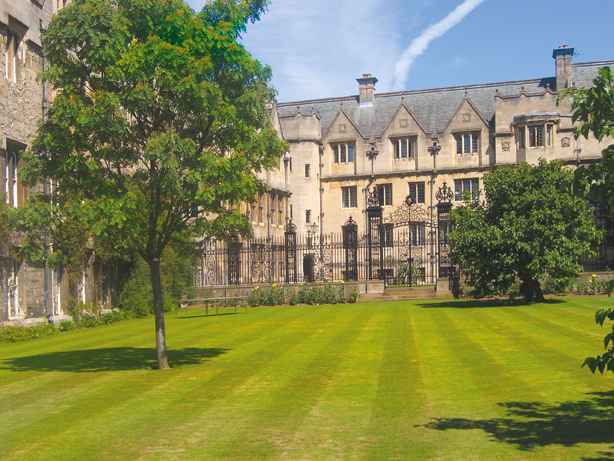 typical medieval library, Merton College Library has an example of chained books, benches, atlases and stained glass. Then on to the newly renovated Ashmolean Museum where Dr. Christopher Brown, Director of the Museum, gave the history of the museum and the concept of the renovations opening up space, making exhibits more accessible and showing things thematically, rather than by age or location. Lara Jukes, Development Director of the BL, was able to join us. Dr. Brown’s wife, Sally Brown, was a BL curator and has spoken to the ATBL members both in New York and in London. 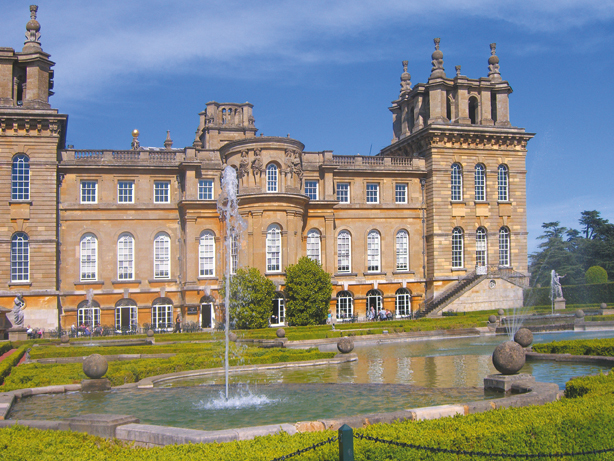 After a satisfying luncheon the root top terrace of the museum, the group was driven to Blenheim Palace. A tour guide gave us a whirlwind tour of the Palace, including Winston Churchill Rooms, library, views, water terrace, Italian Garden, Secret Garden, Temple of Diana and Rose Garden. Wednesday Lara Jukes arranged a splendid information-packed day at the BL. 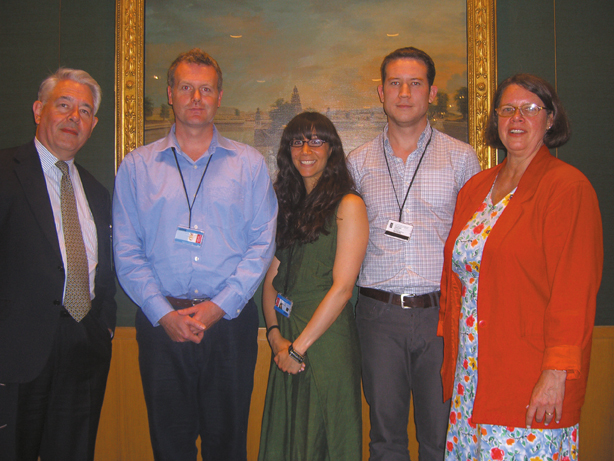 The President, Co-Chair and Executive Director met with Lara, Dame Lynne and Scot McKendrick to talk about the effect of the UK budget on the library which was announced by the Exchequer the day before; and how the ATBL and BL might work together to fundraise more effectively. Dame Lynne then greeted the entire group and told them about BL highlights over the year including a five year review and reorganization making each Director IT savvy as well. Elizabeth James, Curator of British collections showed the BL’s Double Elephant Folio: Audubon’s Birds of America; Ryan Doherty, Production Coordinator, demonstrated Turning the Pages technology; and Roger Walshe, Head of learning, Jonathan Roberson, Curator of Social Science and Adrian Edwards, head of British and Early Printed Collections showed us the next exciting exhibit, “Evolving English: One Language, Many Voices. Dame Lynne hosted lunch and participants were joined by Phil Spence, Director of Scholarship and Collections; Frances Brindle, Director of Strategic Marketing and Communication; Kristian Jensen, Head of Arts and Humanities; and Phil Davies, Curator, American Studies. Peter Barber, Head of Maps Collection, gave the group a private tour of Magnificent Maps: Power, Propaganda and Art (discussed on page 1.) He explained the basic theme of the exhibition that maps have never been simply geographical tools but invariably have cultural and political significance. The group saw the largest item on show, a tapestry map of southern England, and the smallest, an atlas of the British Empire the size of a matchbox, made for Queen Mary, the wife of George V, as well as a map used to negotiate the boundary between the Ottoman Empire and Persia. At tea, the group met the two American ATBL-sponsored interns in Illuminated Manuscripts with their supervisor, Cathleen Dougherty and saw Jake Dalton, ATBL-sponsored IDP intern who is completing his work on identifying scribes of the Tibetan manuscripts. Guests popped into the amazing BL Gift Shop and Book Store and then stayed for the opening reception of Viva La Libertad, attended by South American ambassadors and consuls. A fitting celebration and end to the annual Chairman’s Council trip.